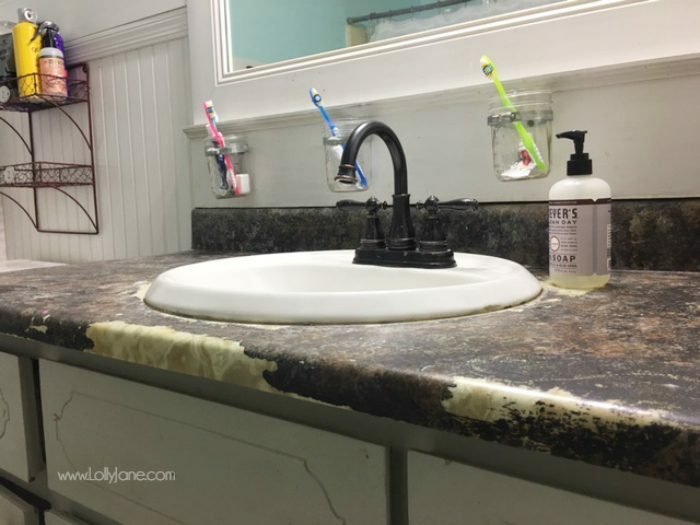 Remember when we covered up our 70’s avocado green laminate counter tops with faux granite paint several years ago? 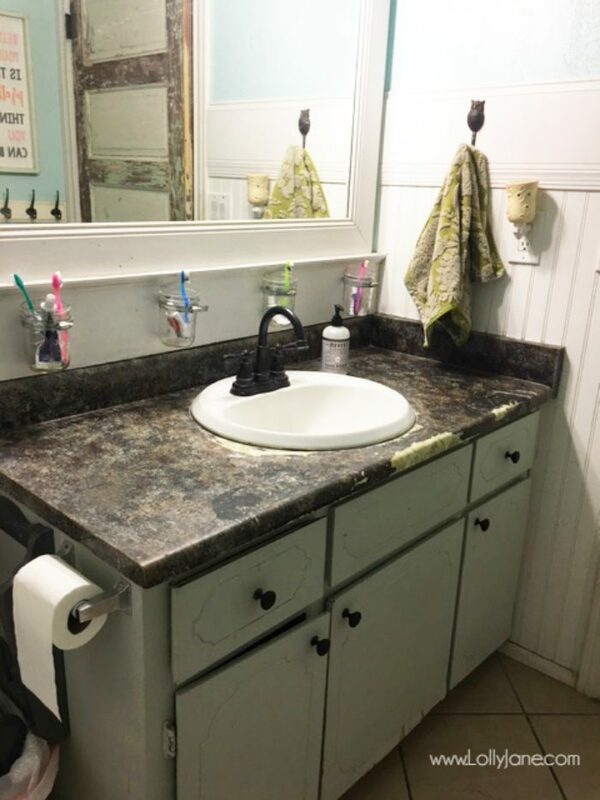 We were asked to share how to properly install a bathroom cabinet and aren’t quite ready to gut this bathroom so we decided to give it a little diy love. Let’s talk chalk paint. Not to be confused with chalkboard paint. Chalk paint is amazing. Annie Sloan created the concoction, making it thicker which requires less layers so you can paint faster. Plus it dries fast faster so you’re done with the total task quickly. We used to wholesale for BB Frosch which is a chalk paint powder. With BBF, you’re able to add the powder to any existing paint to turn it into chalk paint. 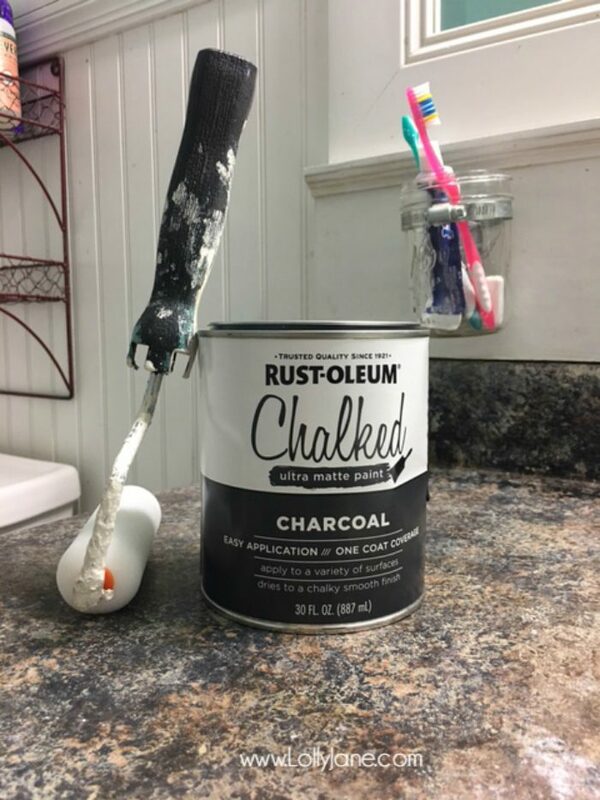 Nowadays, so many paint companies have their own chalk paints on the shelves so we grabbed what was closevby, Rustoleum. As you can see below, the granite has held up pretty well! It only came off from the highest used areas, around the sink and edge where my kiddos grab their toothbrushes. I gave the “granite” a quick sand to smooth it out. Most chalk paints only need one coat but I did two to be safe. I used a basic paintbrush to get into the crevaces then a sponge roller to give it an even coverage. I sealed it with a clear poly and let it dry for 2 hours. I gave it a second coat and let it dry overnight. It’s been 2 weeks but hasn’t budged a bit! 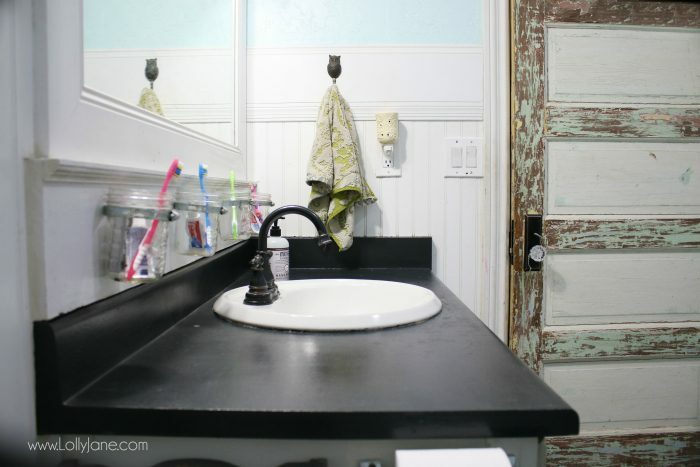 We swapped the dark knobs for some crystal pulls to lighten up the vanity and match my doorknob. 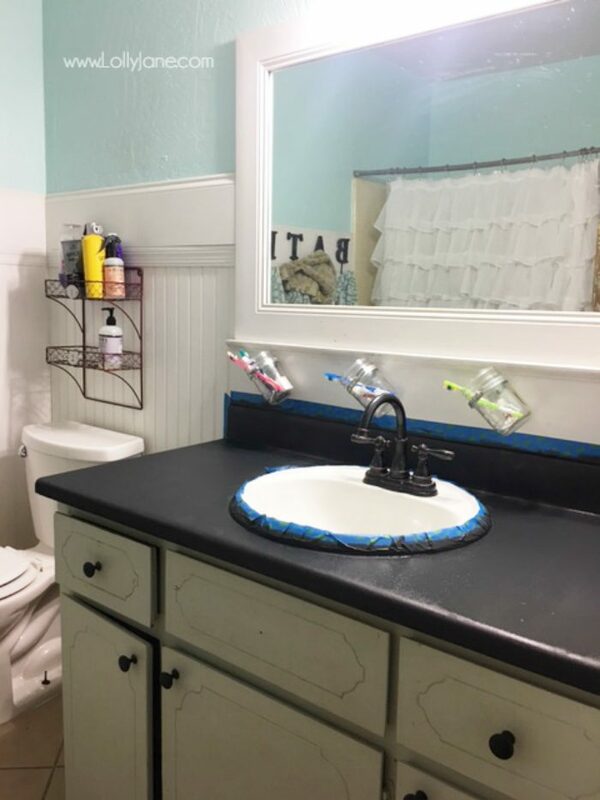 I know what you’re going to ask, would I look at chalk painted countertops as a long term solution? Probably not. We love our little farmhouse but it’s all original: the cabinets are starting to fall apart inside and the baseboards have been soaked a million times in the 40 years of raising kids from several different families (it was a rental for 30 years). We are itching to gut it but want to pay cash, we’re so close! This is a less-than-a-year fix for us. But it looks pretty darn good, temporary or permanently. If you were paying attention…you’ll have noticed the black and white floors in the last couple of pictures. Those were also chalk painted. Stay tuned! Glass Cabinet Pulls: Home Depot, similar ones here. Previous Post: « 36 LipSense colors: did your fav make the cut? Wow- looks great!! I can’t believe it’s painted. It looks like solid surface!! I love painting to add life to old things–I once painted all my cabinets a buttery yellow in my kitchen–it gave us 10+ years of extra use before we ripped them out. 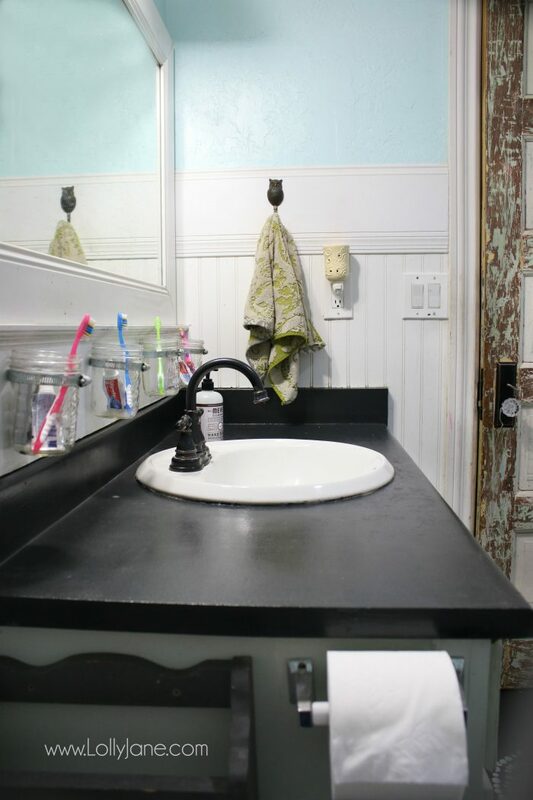 The chalked painted countertops. Has any paint come off at all ? For example when you wipe down or clean the counters does paint come off as if it’s still wet ? Would chalked paint be safe on kitchen counters ? Did you do a post on that awesome door??!! I ❤️ The farmhouse feel. Cozy and comfortable! 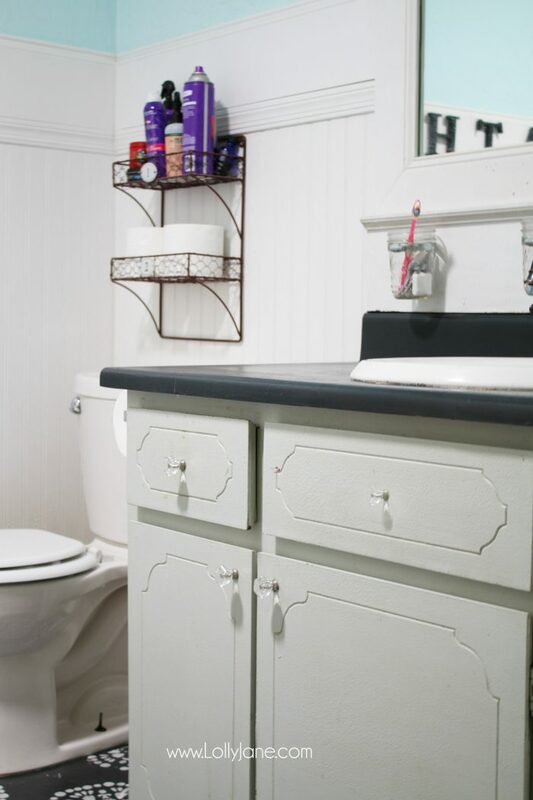 Love what you have done to spruce up your bathroom until such time as gutting occurs. Love your floor painting and stenciling, looks good. 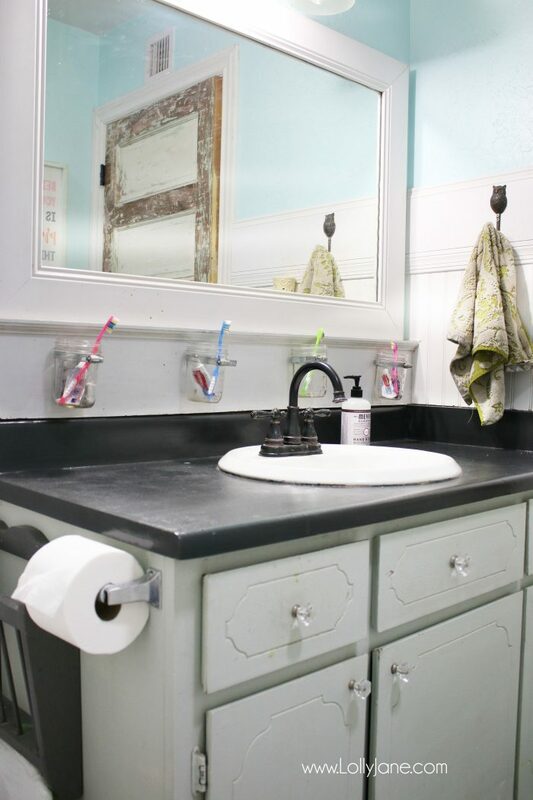 Painting your counter top in bathroom looks pretty doggone good also, sure is inspiring me to give it a go. If Mr. were gone for a day I would be painting our tile floor and countertop in our master bath. Wonder what kind of paint would need to use for tile? 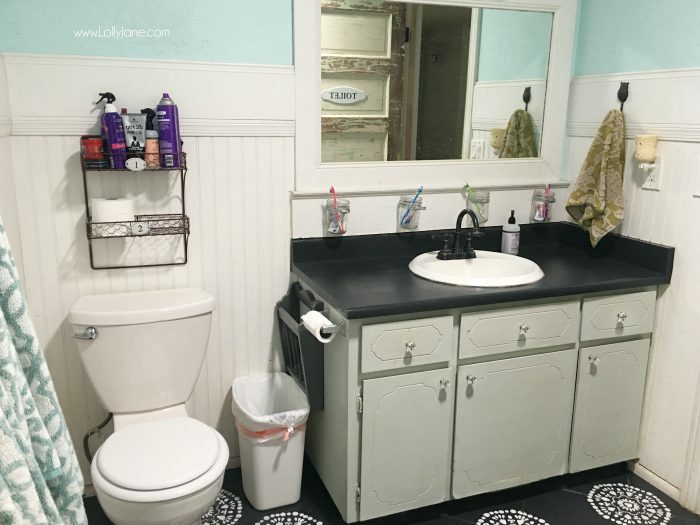 Could use chalk paint for counter but not tiles am thinking. You two are such an inspiration for me, want our little single wide to look nice but living on SS makes doing fixes difficult. Grand Junction is an expensive area for SS income to stretch. When we came here we were paying for house in KY and ins. plus living here.. We lived in an Rv park for 10 months in our old 24 ft.travel trailer, I loved it. But after while Mr. got tired of close quarters to rent a house where we lived while still paying for KY house and living in G.J. I was quite content in my little trailer. Eventually were able to buy a single wide mfg. home on 1/2 acre few miles west of GrandJunction in rural area, still paying for KY house. Talk about living thriftily. Anyway so glad you share your fixes, sure encourages me to keep trying. How are these holding up? I ‘gianni granite’ painted my kitchen counter tops a year ago. I babied them and they still look like total garbage. They are peeling big time. My counter tops are unusable now without flecks of paint in cinnamon bun dough etc. HOWEVER we are still a year or 2 away from re-doing the kitchen. I need something to get me through and I’m debating chalk paint with a clear top coat OR going back to melamine paint (which I tried in my bathroom). What do you think? PS: We used Gianni Granite once upon a time, as well! 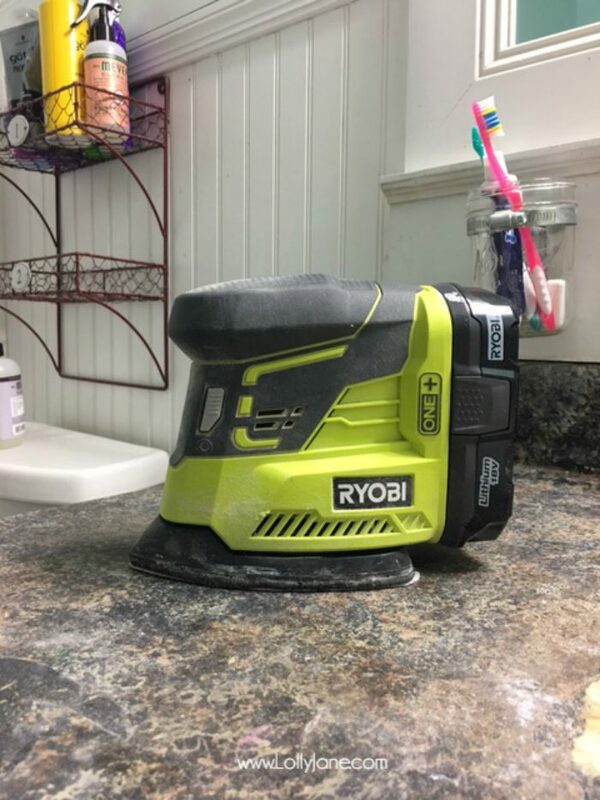 What poly product did you use to seal the counters? I’m on the same process. My poly application keeps getting tiny bubbles! What am I doing wrong? A common cause for bubbles is dipping the brush and then wiping it off on the edge of the can. The solution is to dip in just enough to load the brush properly and then go straight to the work piece without striking off the excess. Of course being careful not to stir in bubbles helps too. When I get bubbles in the poly finish I use a clean, dry foam brush to remove them. Simply and gently drag the tip of the foam brush down the entire length of the project. I also like to use the sure-line 4″ foam rollers when applying polyurethane. The two foam applicators make a good team. What is the best durable paint for kitchen concrete countertop? Hi Charmaine, you can! Just use a good sealer, either a lacquer or a polyacrylic. Happy painting! I wonder if you use a 2 part epoxy if you’ll get a longer life? I want something longer lasting. I wanted to do a torn paper countertop in my kitchen. I’ve set out to makeover my entire kitchen for under $300. For a challenge and since I live on $1000 a month a necessary budget LOL I’m doing torn paper flooring, and was going to do the same to the countertops in a different type of paper all together. I’m painting all the cabinets I put in a new backsplash with the peel and stick tile, and I bought new curtains and cordless blinds. It’s a tiny galley style kitchen.